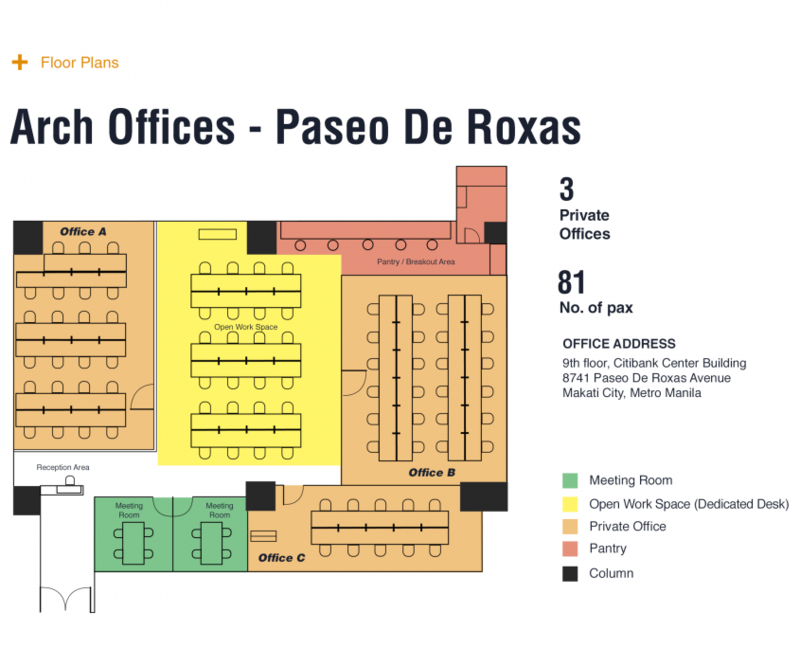 Fully Furnished Private Office Makati - All Inclusive Amenities! Your team’s own workspace. Flexible, fully furnished, plug & play. What is a Private Office? Private office spaces provide startups and SMEs with a flexible work space that can be rented on flexible terms. 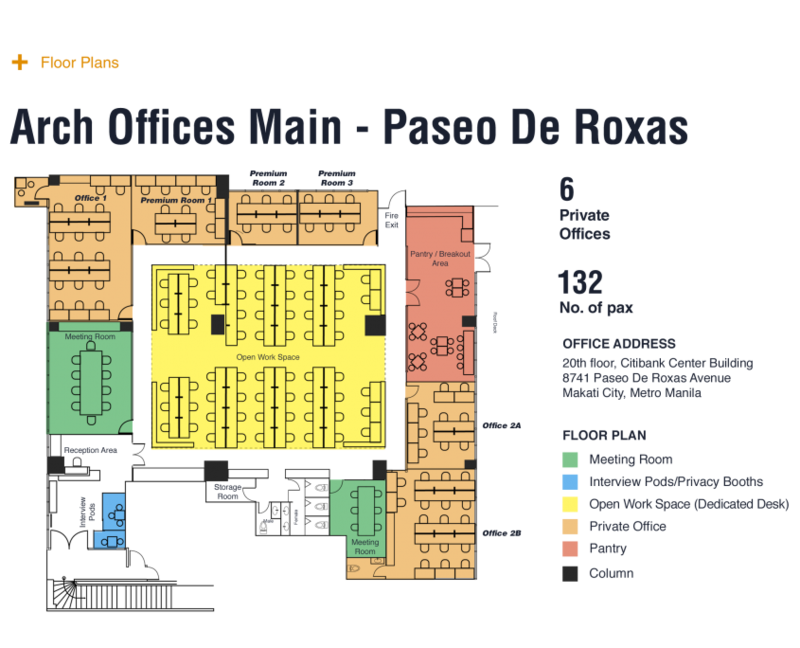 This type of service is a turn-key office solution, allowing businesses to retain the same amenities as a corporate office setting, but without having to purchase and maintain the space. Private offices come fully furnished with desks, chairs, filing cabinets, lockers, biometric security and are customizable to fit your unique needs and company culture. 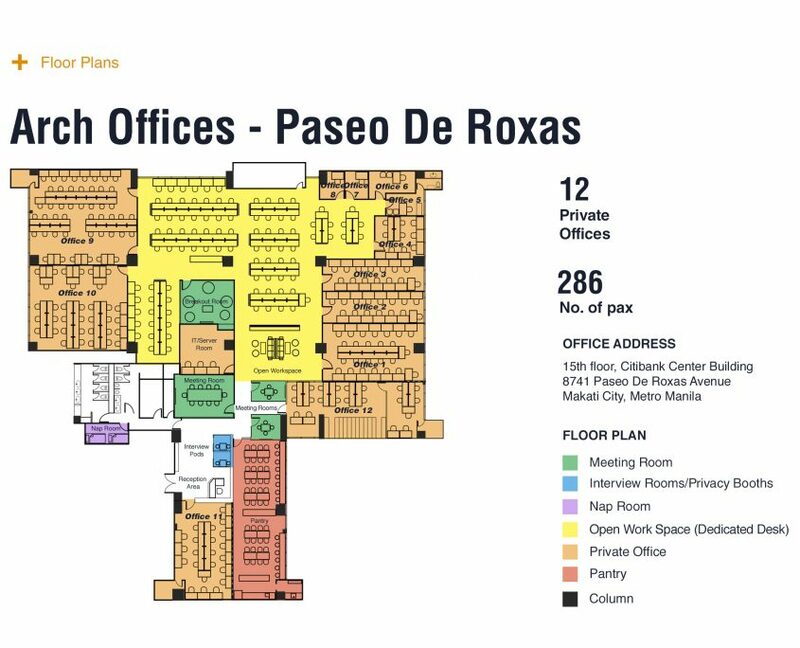 A private office also provides a convenient and prime location for small to mid-sized teams to collaborate on projects or present your brand or company with a credible image and setting to impress clients and investors. What can I get from a Private Office at Arch Offices? Our private offices are all equipped with state of the art facilities and amenities, fully furnished, air-conditioned, and are accessed via biometric system. Giving you maximum flexibility and security with minimum maintenance. 24/7 High Security Access (biometric scan) Looking to keep things more secure and confidential? All our private offices give you secure spaces for full autonomy. Break out area We mixed in mural art and turf laden flooring, coffee tables and chairs, providing a unique shared office-like environment for those who want to break from the sedentary rhythm of office. Complimentary Refreshments Enjoy complimentary alkaline water, unlimited homegrown coffee, fresh fruit or prep your lunch with refrigerators and microwaves in our kitchenette or pantry. Onsite Staff Our Admin and IT team is here for you throughout the workweek, from front-desk service to personalized support to IT support. Access to Conference Rooms Equipped with a TV monitor, LAN cables, Wifi, projectors and mobile whiteboards for quick catch-ups and team meetings. Meeting & Interview pods We have mini office pods designed for concentration, small meetings & private telephone calls. Cleaning Services Cleaning services are available from Monday to Saturday. Our cleaning staff helps keep common areas, conference rooms, and private offices spazzy clean. Is your team ready to grow into a new space, but you’re not sure where to begin? Arch Offices has the workspace solutions you need to create your best work. 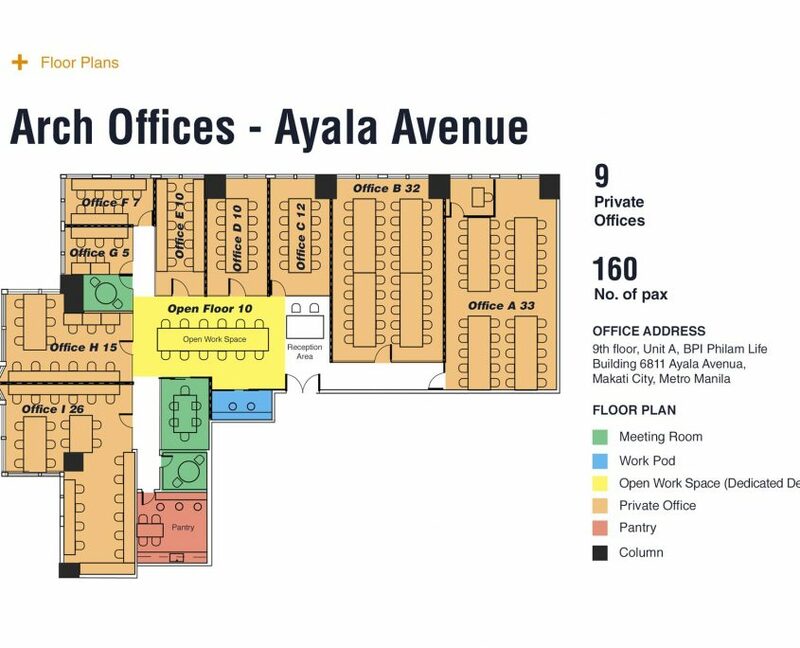 With affordable pricing, our private offices serve as a great starting point for SMEs to save money and eventually scale to own their own company office. 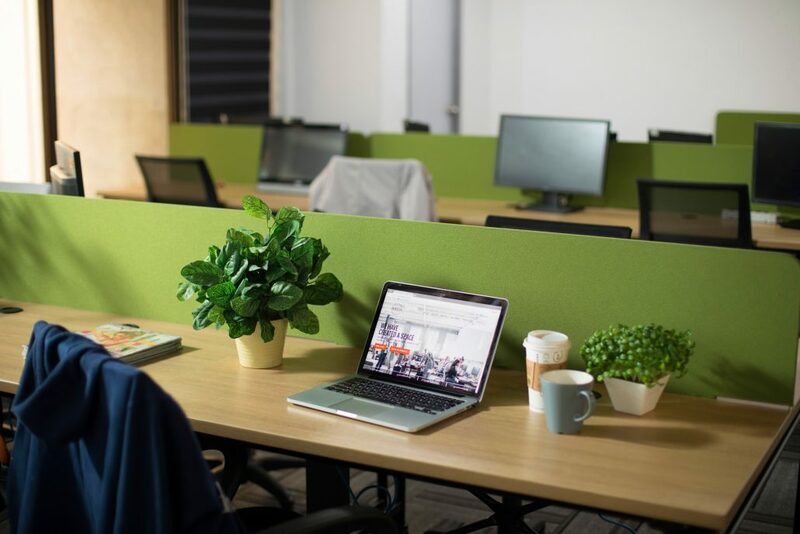 Bringing your team into a private office means you get all the perks of working in a full-fledged office, with everything you need to truly make your space your own. Are you looking for a Private Office? Look no further! Click here to get started. Our sales consultant will get in touch with you.